Not long ago, a valued employee of the Diocese came to see me. He told me that he would be leaving his position with the Diocese because his wife had been offered a wonderful job in the mid-WeSt. He put it this way to me, "This is the job she's always wanted but one thing neither of us want to have is a commuter marriage!" Truth to tell, I will greatly miss this individual but I had to admire his priorities – his marriage and family come firSt. In our conversation, we talked about couples in successful commuter marriages and how challenging it is for them to find enough time to spend together. He observed that some commuter marriages fall apart because the spouses become preoccupied with their work and end up leading separate lives with separate interests. My former employee added these words of wisdom, "What makes our marriage so beautiful is the time we spend together." You can see why I have such a high opinion of this man. About now, you might be asking, what in the world do these thoughts about commuter marriages have to do with Corpus Christi, the Solemnity of the Lord's Body and Blood? Perhaps a bit more than you think! For you see, the Lord didn't come merely to encourage and instruct us; he didn't come into the world merely to get to know us. No, he came to espouse himself, to marry us, if you will. When, true to the admonition of St. Paul in today's second reading, the priest transforms the wine into the precious blood of Christ, he says: "This is the blood of the new and everlasting covenant!" What kind of covenant? A marriage covenant! Christ has taken the Church as his bride, as St. Paul also clearly teaches us, and he has also espoused himself to our souls individually. In other words, Jesus wishes to enter into a most intimate union with our souls. He wishes to be present in the depth of our being and asks us to return his love, just as spouses should be present to one another and reciprocate one another's love. Perhaps you can see the reason why I began this homily speaking of commuter marriages. For a good spiritual life is a lot like a good marriage; it takes time and presence. Our faith teaches that Jesus is truly present to us in the Blessed Sacrament – and that he is present to us in personal and powerful way. But how present are we to the Lord? How much time do we spend with him? If the truth be told, our relationship with the Lord can be something like a commuter marriage. We are busy people – with families to raise, jobs and careers to tend to, problems that absorb us, a social life and hobbies, all the things that are part and parcel of daily life... most of us are on the run, moving around most of the time... It's easy for all the things that preoccupy us to crowd out the Lord so that we no longer spend any quality time with him... like couples who live apart, work apart, and eventually, fall out of love. It's probably true to say that most of us were in fact called to fall in love and stay in love with the Lord— in a sort of "spiritual" commuter marriage. Even though our lives our busy, like spouses in a successful commuter marriage, we have to make sure that our relationship with him is primary, not peripheral, and that we are spending enough time and quality time with the One whose love never fails, whose love is everlasting! Corpus Christi is an opportunity for us to ask ourselves about our relationship with the Risen, Eucharistic Lord. Amid all the sound and fury in our lives, have we really fallen in love with the Lord truly present in the Eucharist? Do we experience what Pope John Paul II called 'Eucharistic amazement' a sense of wonder and awe that the Lord has chosen to be with us in the humble form of bread and wine, and that he has endlessly multiplied his presence among us until the end of time? Have we spent time prayerfully reflecting on the Church's teaching on the Mass and the Real Presence of Christ in the Sacrament reserved? Do we look for opportunities to make visits to churches, to we seek out opportunities for Eucharistic adoration? 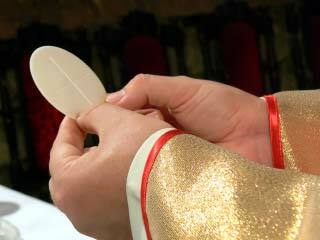 Do we pray for vocations to the priesthood so that we will always have enough priests to celebrate Mass for us? And when we are in the presence of the Blessed Sacrament, what's in our hearts? Are we thinking about our next appointment or a project we need to finish? Are we talking shop to ourselves instead of talking to the Lord? Are we daydreaming? When commuting spouses get together, they need to turn their attention to one another. They need to look at each other in love and to speak to each other from the heart, not continue their busy existence. So too, when we kneel before the Blessed Sacrament, we must allow his heart to speak to our heart, to inform our minds with his truth and to inflame them with his love, to shape us into images of his own goodness and glory. And yes, just as spouses sometimes have to make an extra effort to pay attention to each other and to communicate with each other, so too we often have to make an extra effort to stay focused on Christ, even when we do not receive consolation from our prayer. A final note. For a commuter marriage to work, the spouses have to find a way to imitate couples who are with each other most of the time. Commuter couples may spend less time than other couples but they must spend enough time and it has to be time well spent. So too in our relationship with the Lord. We may not spend as much time before the Blessed Sacrament as, let's say, a cloistered nun – but we'd do well to imitate at least something of her faith and her devotion, something of her closeness to Jesus and her desire to pray always, so that we will be sustain in our vocations, our occupations, and our pre-occupations! On this Corpus Christi let us resolve never to be absent from the Lord who is truly present to us. O Sacrament most holy, O sacrament divine, all praise and all thanksgiving be every moment thine! How to Handle Rejection By Msgr. Frank C. Wissel, D.Min.